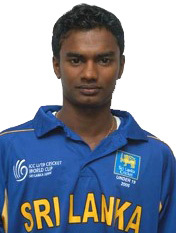 Malinda Pushpakumara (born 24 March 1987 in Sri Lanka capital city Colombo) is a slow left-arm spinner who plays for Moors Sports Club. He took the most wickets in the 2016-17 Premier League Tournament, with a total of 77 dismissals from 9 matches and 18 innings. The consistency with which he has performed is not only consigned to the A team, but in the past three seasons he has won the best bowler award twice by topping over 50 wickets in the Premier league for his club. On 3 August 2017, finally he was debut in second Test against India at SSC, Colombo and on 31st August make ODI debut.